Sudoku just got bigger - samurai-sized infact. This fantastic book contains two different types of 5-grid samurai puzzles: the standard 5-grid pattern like the five on a dice, that is, a quincunx, and also five more tightly overlapping grids in the puzzle type known as star sudoku or flower sudoku (the grids form a shape similar to the plus symbol). 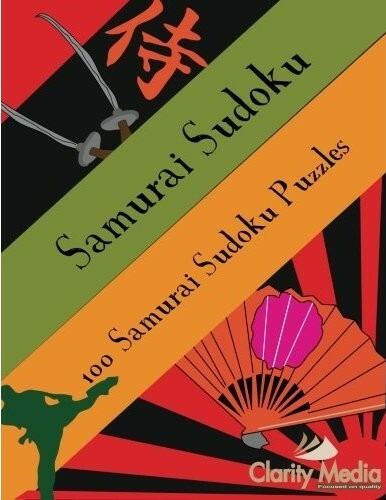 This book contains 100 samurai puzzles in total - 50 of each of the above two types. There is just one puzzle per page so there is space to write your pencilmarks inside the grid whilst solving each puzzle. There are full solutions at the back, and there is of course just one solution to each puzzle reachable through logic alone. There is a brief introduction and how to solve information at the start before the puzzles themselves. The rules are as with normal sudoku, but of course you need to use the overlapping regions between puzzles well in order to solve the puzzles and make all the relevant deductions that will enable you to solve these puzzles. 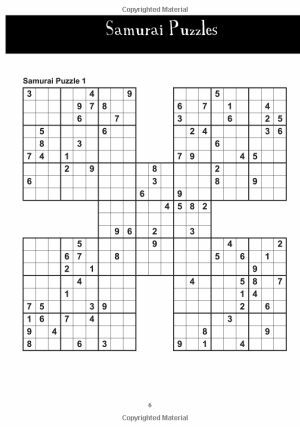 As they are samurai puzzles with five grids, then they will take longer to solve than normal sudoku puzzles. As the grids overlap a lot more in star sudoku - indeed the fifth grid is fully composed of squares that are in the other four grids - then the use of the overlapping regions is much more prevalent in star sudoku than in ordinary samurai sudoku. What is the difference between samurai sudoku and star sudoku? Samurai sudoku is the most commonly seen five-grid overlapping sudoku puzzle. You can see an image of one to the right: it has the distinctive shape similar to a five on a dice, called a quincunx. The samurai-star sudoku also has five overlapping grids, but the overlap is a lot tighter: for an example of what a completed puzzle looks like, take a look at Samurai Star Sudoku. Do the two samurai sudoku types solve differently? Yes, you will have a very different solving experience with the two types. The standard shaped samurai sudoku puzzles at the start of the book solve in the large part like standard sudoku, but with the key that you need to pay attention to the overlapping regions of which there are four in total, all box regions. However, with the samurai star variant, there are many, many more overlapping regions and indeed the central puzzle is formed entirely from the other four grids in the puzzle. Therefore the key rule you will use here is the rule that tells you that squares fully shared between two regions can only have an instance of a number once: with samurai star sudoku you can quickly remove any givens from squares that are shared (overlap) with those in regions of other puzzles. Take a look at the solution grid shown at the link above to samurai star sudoku and you should start to notice how powerful this is when it comes to solving these puzzles. What is the difference between volume 1 and volume 2 of the book? The first volume of the book contains 50 samurai sudoku and 50 samurai-star sudoku puzzles. The second book contains just 100 samurai sudoku. So if you want to try something different, then book 1 is best for you - if you want to stick to standard 5-grid samurai puzzles, then book 2 is more suitable for you.